"Sahabi" redirects here. For the surname, see Sahabi (name). Companions of the Prophet or aṣ-ṣaḥābah (Arabic: الصحابة‎ meaning "the companions", from the verb صَحِبَ meaning "accompany", "keep company with", "associate with") were followers of Mohammed who "saw or met the prophet during his lifetime and were physically in his presence". "Sahabah" is definite plural; the indefinite singular is masculine sahabi (ṣaḥābī), feminine sahabia (ṣaḥābīyat). Later scholars accepted their testimony of the words and deeds of Muhammed, the occasions on which the Quran was revealed and other various important matters of Islamic history and practice. The testimony of the companions, as it was passed down through trusted chains of narrators (isnads), was the basis of the developing Islamic tradition. From the traditions (hadith) of the life of Muhammad and his companions are drawn the Muslim way of life (sunnah), the code of conduct (sharia) it requires, and the jurisprudence (fiqh) by which Muslim communities should be regulated. Lists of prominent companions usually run to 50 or 60 names, being the people most closely associated with Muhammad. However, there were clearly many others who had some contact with Muhammad, and their names and biographies were recorded in religious reference texts such as Ibn Sa'd al-Baghdadi's (Muḥammad ibn Sa'd) early Kitāb at-Tabāqat al-Kabīr (The Book of the Major Classes). The book entitled Istî'âb fî ma'rifat-il-Ashâb by Hafidh Yusuf bin Muhammad bin Qurtubi (died 1071) consists of 2,770 biographies of male and 381 biographies of female Sahabah. According to an observation in the book entitled Mawâhib-i-ladunniyya, an untold number of persons had already converted to Islam by the time Muhammad died. There were 10,000 by the time Mecca was conquered and 70,000 during the Battle of Tabouk in 630. Some Muslims assert that they were more than 200,000 in number: it is believed that 124,000 witnessed the Farewell Sermon Muhammad delivered after making his last pilgrimage (hajj) to Mecca. The most widespread definition of a companion is someone who met Muhammad, believed in him and died as a Muslim. The Sunni scholar Al-Hâfidh Ibn Hajar (d.852H) said: “The most correct of what I have come across is that a Sahâbî (Companion) is one who met the Prophet Muhammad - sallallâhu ’alayhi wa sallam - whilst believing in him, and died as a Muslim. So, that includes the one who remained with him for a long or a short time, and those who narrated from him and those who did not, and those who saw him but did not sit with him and those who could not see him due to blindness". Anyone who died after rejecting Islam and becoming an apostate is not considered as a companion. Those who saw him but held off believing in him until after his passing are not considered Sahaba but Tabi`in. Shia Muslims make no distinction between these as regards their trustworthiness. According to Sunni scholars, Muslims of the past should be considered companions if they had any contact with Muhammad, and they were not liars or opposed to him and his teachings. If they saw him, heard him, or were in his presence even briefly, they are companions. All companions are assumed to be just (udul) unless they are proven otherwise; that is, Sunni scholars do not believe that companions would lie or fabricate hadith unless they are proven liars, untrustworthy or opposed to Islam. As Shia Muslim believe  as well as some sunni scholars like Javed Ahmad Ghamidi and Amin Ahsan Islahi state that not every individual who met or had accidentally seen Muhammad can be considered as a Companion. In their view, the Quran has outlined a high level of faith as one of the distinctive qualities of the Sahabah. Hence, they admit to this list only those individuals who had substantial contact with Muhammad, lived with him, and took part in his campaigns and efforts at proselytizing. In other words, Companion is called to followers of prophet who be in a long-term relationship with him and support him in essential event up to their death. In view of such admonitions, Shias have different views on each Sahabi, depending on what he or she accomplished. They do not accept that the testimony of nearly all Sahabah is an authenticated part of the chain of narrators in a hadith and that not all the Sahaba were righteous just because they saw or were with Muhammad. 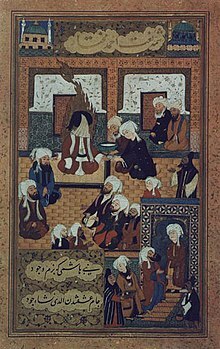 Shias further argue that the righteousness of Sahabah can be assessed by their loyalty towards Muhammad's family after his death and they accept hadith from the Imams of the Ahl al-Bayt, believing them to be cleansed from sin through their interpretation of the Quran [l] and the hadith of the Cloak. Shia Muslims believe that some companions are accountable for the loss of caliphate by the Ali's family. The Bahá'í Faith recognises the companions of Muhammad. They are mentioned in the Kitáb-i-Íqán, the primary theological work of the Baha'i religion. According to Tarikh al-Tabari, After the death of Muhammad prophet, Abu Bakr, Umar Ibn al-khattab and abu Ubayda ibn al-Jarrah and some companions called Ansar made a consultation and selected Abu Bakr as the first caliph. Then Abd al-Rahman bin Awf (the first companion of prophet) and Uthman ibn Affan (companion and essential chief of the Banu Umayya clan) selected Umar ibn al-Khattab as the second caliph after the death of Abu Bakr and other members of Ansar and Muhajirun accepted him. Sunni Muslim scholars classified companions into many categories, based on a number of criteria. The hadith quoted above ([n][o]) shows the rank of ṣaḥābah, tābi‘īn, and tābi‘ at-tābi‘īn. Al-Suyuti recognized eleven levels of companionship. Shia does not have a ranking system dependent on when the Sahabi embraced Islam but according to what they did during their life. If a Sahabi made Muhammad angry or questioned his decision several times then he is viewed as unreliable. Following the consultation of companions about the successor of Muhammad prophet, the Shia scholars, therefore, deprecate hadith believed to have been transmitted from alleged unjust companions and place much more reliance on hadith believed to have been related by Muhammad's family members and companions who supported Ali. The Shia claim that Muhammad announced his successor during his lifetime at Dawat Zul Asheera then many times during his prophethood and finally at Ghadeer e Khum. Shias consider that any hadith where Muhammad is claimed to have absolved all Sahabah from sin is a false report by those who opposed the Ahl al-Bayt. ^ Adil, Hajjah Amina. Muhammad the Messenger of Islam: His Life & Prophecy. Islamic Supreme Council of America. ISBN 978-1930409118. ^ a b Encyclopedia Britannica. Britannica Concise Encyclopedia. Encyclopedia Britannica Inc. ISBN 978-0852299647. ^ a b The Editors of Encyclopaedia Britannica. "Companions of the Prophet". britannica. ^ Esposito, John L. (2003). The Oxford Dictionary of Islam. Oxford University Press. p. 301. ISBN 9780195125597. Retrieved 9 March 2019. ^ "Sahaba". livingislam.org. Archived from the original on 2014-10-08. "Once a male or female Muslim has seen Muhammad only for a short time, no matter whether he/she is a child or an adult, he/she is called a Sahaba with the proviso of dying with as a believer; the same rule applies to blind Muslims who have talked with the Prophet at least once. If a disbeliever sees Muhammad and then joins the Believers after the demise of Muhammad, he is not a Sahaba; nor is a person called a Sahaba if he converted to Islam afterward although he had seen Muhammad as a Muslim. A person who converts to Islam after being a Sahaba and then becomes a Believer again after the demise of Muhammad is a Sahaba. ^ Jabali, Fu'ad. "A STUDY OF THE COMPANIONS OF THE PROPHET: GEOGRAPHICAL DISTRlBUTION AND POLITICAL ALIGNMENTS (1999)" (PDF). nlc-bnc.ca. ^ a b Taqi poor, Hussain. "reviewing of the article "Companions of the Prophet" authored by linda L. Kim". noormags. ^ "Archived copy". Archived from the original on 2015-01-08. Retrieved 2014-12-29. CS1 maint: Archived copy as title (link) "The Kitáb-i-Íqán PART ONE". BAHA'I REFERENCE LIBRARY. Retrieved 2014-09-10. ^ Fitzpatrick, Coeli. 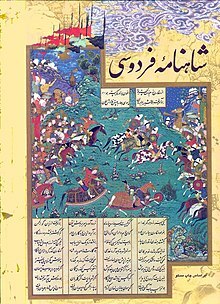 Muhammad in History, Thought, and Culture. ABC-CLIO 2014. ISBN 978-1610691772. ^ Afsaruddin, Asma. "Companions of the Prophet (2008)". oxford islamic studies. ^ Razwy, Sayed Ali Asgher. A Restatement of the History of Islam & Muslims. p. 276. ^ Hadi, Muhammad. "Companions of the Prophet in view of Quran and Imams". noormags. Osman, Amr, Companions, in Muhammad in History, Thought, and Culture: An Encyclopedia of the Prophet of God (2 vols. ), Edited by C. Fitzpatrick and A. Walker, Santa Barbara, ABC-CLIO, 2014.